“A turkey vulture is a perfect creature.” The opening line of the main text captures the entire premise of the book. The subtitle to Vulture is a bit misleading: The Private Life of an Unloved Bird. Katie Fallon herself belies it. She loves vultures. Turkey vultures, black vultures, old world, new world, condors and gryphons and buzzards and any other name you care to give them. That is not to say they are the easiest birds to love. Although their colors can be beautiful, their habit of eating by plunging their heads into open carcasses can be off-putting. And although there are no documented cases of vultures harming humans and very few credible stories of vultures going after live prey at all, birds which attack aggressors by hissing and projectile vomiting at them are less highly regarded than those which simply tweet assertively. None of these things dissuades Fallon, though, who has a vulture friend named “Lew,” and who buys vulture onesies for her daughters, and who has traveled extensively studying vultures around the US and beyond. Fallon unabashedly loves vultures, and after reading this book, maybe I do, too. Vulture was chosen for the Centre County (PA) Reads program, an effort to have as many people as possible in our county read the same book. I will admit, I was not entirely sure why the book was chosen before reading it. Now, I can see the choice was inspired. Katie Fallon has local roots. A Pennsylvania resident for much of her life (now living in next-door West Virginia), Fallon is a Penn State University graduate. Apart from the local connections, the book itself is beautifully written and deeply thoughtful. Each chapter starts with a short essay written from the perspective of a vulture. These are done without anthropomorphizing the animals. She does not attempt to interpret their emotions. Rather, she writes about more basic feelings: hunger, cold, wind. After these short essays come chapters that go into depth on the vultures themselves, on her life as a birder, on her work with her husband in caring and rehabilitating injured birds, and on her family’s fascination with these creatures. She includes carefully worded essays that are very pro-hunting but anti-lead-ammunition, explorations of the dangers posed by chemicals in mammals to the birds which eat their carcasses, and celebrations of the work being done by scientists who are studying the migratory patterns and other behaviors of these birds. Although turkey vultures are doing very well right now, other vulture species around the world are threatened and endangered. Most notably, the California condor population had fallen to 27 individuals before unprecedented species recovery efforts began. The population is now up to several hundred, but that is still an extremely small number of birds and there are no guarantees it is a sustainably stable population. Without human help, the condor population would quickly die. Of course, without humans they would not have almost gone extinct to begin with, so there is an argument to be made that we bear responsibility to fix what we’ve broken. Fallon includes a number of personal and family anecdotes in the book, some of which are quite funny. Her efforts to see a vulture named “Jennie” take her to an elementary school and to the edge of an Air Force bombing range, where she ultimately decides that jumping the fence and dodging rattlesnakes and unexploded ordnance might not be the best course of action. Part of this decision was the potential for the headline, “Mother arrested…,” which fortunately remains unwritten outside of her book (and now this review). She does not actually cross the fence. Fallon concludes her book with a number of steps that individuals can take to help preserve and protect vultures. Most importantly is a decision by hunters to eschew lead ammunition. Katie Fallon is pro-hunting and pro-gun. However, lead bullet fragments are poisonous to vultures. “Gut piles” are a valuable and vital source of food for wild vultures, but when they are contaminated by lead, they become deadly, especially to their chicks. Although I am not a hunter, this seems like a reasonable and doable request, and I would hope that hunters would take this concern seriously. Vulture is a very good book for any independent readers who love animal stories, though the youngest readers might find some of the scientific vocabulary challenging. 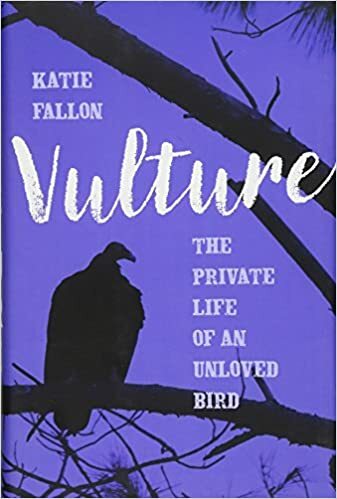 Anyone who enjoys animals and natural history stories will appreciate the personal and scientific approach Katie Fallon uses to tell the story of a bird that may be underappreciated, but thanks to her cannot truly be called unloved.